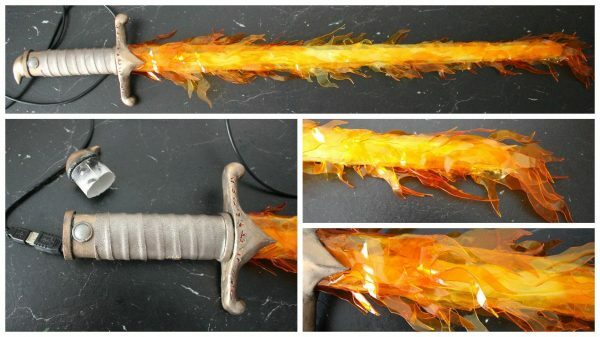 Flaming Sword Made with LEDs and Arduino « Adafruit Industries – Makers, hackers, artists, designers and engineers! The board is a arduino nano, the LED type is calles ws2812b. These are color changing LEDs, so you can program them to light up any color you want ( I think). They come in different densities, mine have 144 LEDs per meter. My cousin helped me with this because my knowledge about electronics is very basic. The programming we found online and simply had to change the amount of LEDs and the brightness. I glued the stripe to a piece of acrylic glass and wrapped it with organza for light diffusion. 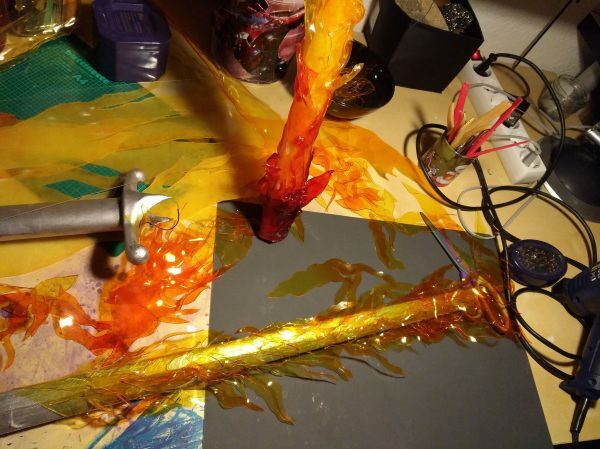 View this Facebook video to see the finished sword light up.